What Are the Symptoms of High Cholesterol in Children? What Are the Risk Factors for High Cholesterol in Children? What Is the Treatment for High Cholesterol in Children? High cholesterol is a risk factor for coronary heart disease in adults, but some children may be at risk for premature coronary heart disease if they have high cholesterol levels earlier in life. Most parents don't know their children's risks, and health care professionals often don't test children's cholesterol levels. According to the American Heart Association, there is sound research that the process of cholesterol buildup in arteries begins in childhood. Childhood may be the time to intervene with lifestyle changes that include sound diet and plenty of exercise, especially for children determined to be at high risk. The body produces cholesterol in the liver and makes what it needs. Additional cholesterol is added from foods, such as egg yolks, dairy products that are not fat free (such as ice cream), and red meat. A certain amount of cholesterol is important for a child's body to function. Cholesterol helps build cell walls in all tissues and forms hormones. Too much cholesterol in the blood can build up in the walls of the coronary artery feeding blood to the heart muscle, and can lead to blockage and eventual heart disease or heart attack as an adult. Cholesterol and triglycerides (fats carried in the blood that partially come from foods) are carried in the bloodstream by lipoproteins. Low-density lipoproteins (LDL) and high-density lipoproteins (HDL) make up most of a person's cholesterol. This is what is measured when a cholesterol blood test is performed. If a person has too high a level of low-density lipoproteins (LDL, the bad kind) in the blood, it can build up in the walls of the arteries and cause a blockage leading to heart attack or stroke. LDL cholesterol numbers need to be low. The HDL (the good kind) lipoprotein can carry cholesterol out of the arteries. HDL cholesterol numbers need to be high. For some children, it's important to know the levels of the lipoproteins and overall cholesterol level to adjust diet and slow the progress of any build up in arteries early. While there are generally no signs or symptoms of elevated cholesterol levels during childhood, adults may have small fat deposits on their skin, enlargement of the liver and spleen, and ultimately heart attack, stroke, and peripheral vascular disease. race (African Americans risk > American Indians > Mexican Americans > Caucasians. The National Cholesterol Education Program's (NCEP) Expert Panel on Blood Cholesterol in Children and Adolescents endorses these guidelines when measuring cholesterol levels in children. These guidelines are also supported by the major health organizations including the American Heart Association and the American Academy of Pediatrics. Acceptable cholesterol levels for adults are different than levels recommended for children and are somewhat higher. The most current recommendation is to screen children and adolescents with a positive family history of dyslipidemia or premature (≤55 years of age for men and ≤65 years of age for women) CVD or dyslipidemia. It is also recommended that pediatric patients for whom family history is not known or those with other CVD risk factors, such as overweight (BMI ≥ 85th percentile, <95th percentile), obesity (BMI ≥ 95th percentile), hypertension (blood pressure ≥ 95th percentile), cigarette smoking, or diabetes mellitus, be screened with a fasting lipid profile. For these children, the first screening should take place after 2 years of age but no later than 10 years of age. Screening before 2 years of age is not recommended. A fasting lipid profile is the recommended approach to screening, because there is no currently available noninvasive method to assess atherosclerotic CVD in children. This screening should occur in the context of well-child and health maintenance visits. If values are within the reference range on initial screening, the patient should be retested in 3 to 5 years. For pediatric patients who are overweight or obese and have a high triglyceride concentration or low HDL concentration, weight management is the primary treatment, which includes improvement of diet with nutritional counseling and increased physical activity to produce improved energy balance. For patients 8 years and older with an LDL concentration of ≥190 mg/dL (or ≥160 mg/dL with a family history of early heart disease or ≥2 additional risk factors present or ≥130 mg/dL if diabetes mellitus is present), pharmacologic intervention should be considered. The initial goal is to lower LDL concentration to <160 mg/dL. However, targets as low as 130 mg/dL or even 110 mg/dL may be warranted when there is a strong family history of CVD, especially with other risk factors including obesity, diabetes mellitus, the metabolic syndrome, and other higher-risk situations. Because most parents whose children have high cholesterol have high levels themselves, and because diet and exercise monitored by a parent are so important in lowering cholesterol levels, treatment is a family affair. Do not scare your child. Present the facts about high cholesterol in an age-appropriate way. Ask your health care professional for advice. Discuss ways to help your child improve his or her health. Do not present it as treatment for a disease. Emphasis should be made that the goal is for everyone in the family to be as healthy as possible. Plan family meals and monitor what your child eats. Pay special attention to cholesterol and fats in foods. If your child eats a school-sponsored lunch, make sure that his or her choices are all healthy options. Pizza, hamburgers, French fries, and fried chicken strips should be avoided. Plan family activities that involve exercise, such as walks, hikes, games, and organized sports. Adults should have 45 minutes a day of moderate intensity activity; children should participate in 60 minutes a day in vigorous play a day. Have your child's cholesterol levels retested after 3 months of changes in diet. Talk with your child's health care professional about the use of medication. It is usually only considered for children older than 10 years, and ONLY after changes in diet and exercise have been tried. The success of this diet depends on a number of factors, including the saturated-fat intake before changes are implemented. Because dyslipidemia is often a familial problem, some children will already be on a diet relatively low in saturated fat. For these children with a genetic cause of dyslipidemia and LDL concentration of ≥190 mg/dL, it is unlikely that diet alone will achieve appropriate concentrations of LDL. Nevertheless, it is important to implement dietary changes that are associated with reduction of LDL concentrations, which may allow for use of lower doses of pharmacologic agents when they are started. Dietary changes are still an important part of any long-term intervention. Implementation of this more aggressive diet is likely to require involvement of a dietitian to help families make the appropriate changes without compromising good nutrition. There have been anecdotal reports of parents implementing a very low-fat diet without supervision, leading to nutritional insufficiency and failure to thrive. The home environment is very important to help children and adolescents make the best choices and maintain a healthful diet. Parents must be empowered to choose the time and available food and drink for meals and snacks. It is most helpful if everyone in the family is consuming a healthful diet and parents act as a role model for their children. Dietitians can also help children and their families navigate the food environment outside the house, which has become increasingly important because more children do more eating outside the home environment. Read food labels for essential information. Labels can tell you how many calories are in a food item per serving and how large a serving is. Individuals can also find out how much fat is in a serving and how much of that fat is from saturated fats (the ones to avoid). Emphasize foods from 5 areas: fruit, vegetables, whole grains such as cereals and breads, beans, and fish. These are low in cholesterol (and will contribute to lowering your child's blood cholesterol). If a meat dish is served, try lean meat such as skinless chicken breast. Trim off all visible fat on any meat before eating. Choose low-fat dairy products such as skim milk or low-fat yogurt. Avoid fats in cooking. Grill or bake. Do not fry. In healthy weight children, reduce or halt intake of soft drinks and reduce the amount of fruit drinks, and low-fat snacks. Avoid these products in overweight children. These provide mainly empty calories and little or no nutrients. Reduce intake of foods high in cholesterol. Cholesterol is found in dairy products (choose skim milk and fat-free dairy products), meat, poultry, fish, and shellfish such as shrimp. Especially avoid organ meats such as liver. Eggs are one example of a food that has an easy cholesterol-free solution. Substitute egg whites or cholesterol-free egg beaters. Try these in recipes that call for eggs. Use liquid or tub margarine instead of butter as they are lower in saturated fat. Avoid trans fats. These are a type of saturated fat usually found in cookies, crackers, baked goods, and hard margarine. Avoid the food if among the ingredients is hydrogenated oils (these are trans fats). Use soft margarine instead. Trans fat content is listed on food labels. Switch your child's snacks away from cookies and crackers to fruits, raw vegetables such as baby carrots, and plain unsalted popcorn or pretzels. The best snacks are apple slices with natural peanut butter, orange sections, fruit stirred into nonfat yogurt, juice bars, sherbet, lite or nonfat popcorn, low-fat pita chips, and low-fat bagel chips. Pack a healthy lunch for your child to take to school. For school lunches, pack low-fat or fat-free lunch meat sandwiches made with whole-grain bread. Low-fat cheese can be added, but a better choice would be tomato slices and lettuce. Vending machines can be a dilemma. Help you child choose the lower fat versions of chips or pretzels or teach them to avoid "food in machines" entirely. Avoid using soda machines. Kids are kids, and you will have trouble denying fun foods at birthday parties and school events. High-fat foods such as hot dogs, ice cream, fries, and pizza can still be part of your child's diet when balanced with other healthful foods the same day and during the rest of the week. Do not reward children with high-fat foods as this can develop into a life-long dietary habit. Use breakfast as a time to select high-fiber foods such as cereals (with skim or 1% milk) and whole-grain breads for toast. Fruit such as an apple will have more fiber than apple juice, so opt for the fruit and not the juice. Increased physical activity, such as biking, running, walking, and swimming, may be useful for improving dyslipidemia in children and adolescents. Physical activity primarily affects HDL and triglyceride concentrations, but improvement of LDL concentration has also been documented. Although there have been few randomized clinical trials to document the effects of physical activity as a specific intervention for children and adolescents, supportive data are available from epidemiologic studies. Exercise combined with a healthy diet definitely helps prevent obesity. See if your child is interested in team sports. Lobby for recess activities and physical education classes in your child's school. Nov. 11, 2011 -- When you look at a child, you don't think heart disease. But in a sign of the times -- these obese times -- new guidelines today are urging that all children between the ages of 9 and 11 be screened for high cholesterol. In addition, the guidelines call for the same children to again be screened between the ages of 17 and 21. Why? Because keeping children's cholesterol in the healthy range may help prevent the onset of heart disease later in life. 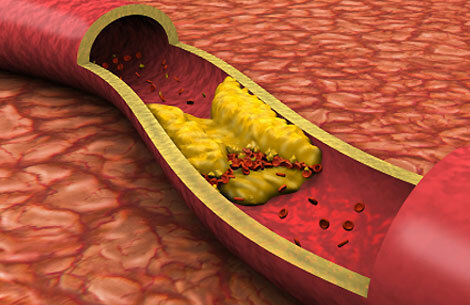 High cholesterol is a chief cause of atherosclerosis, or hardening of the arteries, a major cause of heart disease. SOURCE: WebMD.com. A Wake-Up Call: All Children Should Be Tested for High Cholesterol. MedscapeReference. Pediatric Lipid Disorders in Clinical Practice. NIH Heart, Lung and Blood Institute. Low-Calorie Step 1 Diet. NIH Heart, Lung and Blood Institute. Low-Calorie Step 2 Diet. Previous contributing authors and editors: Author: William Winter, MD, Professor, Departments of Pathology and Laboratory Medicine and Pediatrics, University of Florida College of Medicine. Coauthor(s): Desmond Schatz, MD, Professor, Medical Director of Diabetes Center, Department of Pediatrics, Division of Endocrinology, University of Florida. Editors: Alan D Forker, MD, Program Director of Cardiovascular Fellowship, Professor of Medicine, Department of Internal Medicine, University of Missouri at Kansas City School of Medicine; Francisco Talavera, PharmD, PhD, Senior Pharmacy Editor, eMedicine; Michael E Zevitz, MD, Clinical Assistant Professor, Department of Medicine, Rosalind Franklin University of Medicine and Science, Chicago. What symptoms and signs did your child experience with high cholesterol?